The Viking Thorkell the Tall had entered the service of King Æthelred, Edmund's father, in 1012, but evidently switched his allegiance to Cnut at some stage during the latter's campaign of conquest 1015–16. The Norwegian earl Eric of Hlathir was Cnut's brother-in-law. Eadric Streona was an English ealdorman who became notorious for his treacherous shenanigans. The placing of of these worthies' executions in the ‘Anglo-Saxon Chronicle’ suggests they took place in the Spring or early-Summer of 1017, but Florence of Worcester maintains it was on Christmas day, at London, that Cnut ordered their deaths. According to Florence, Cnut feared Eadric would eventually betray him as he had previously betrayed Æthelred and Edmund. He ordered that Eadric: “be slain in the palace ... and commanded his body to be thrown down from the walls and left unburied.” Florence protests that the other named victims: “had committed no crimes.” He also credits Northman with the rank of ealdorman, and adds: “The king made Leofric an ealdorman in place of his brother, Northman, and afterwards took him very high into favour.” Northman, however, features in the witness-list of a charter dated 1017 (S1384) as a thegn (minister), not an ealdorman (dux), and though Leofric would indeed achieve high office, he is not reliably recorded as dux until 1032 (S964). When the tide rises, Thames beats it. He sent for all the citizens. I know not if it had its equal under heaven. He caused a rod to be twisted round. From the body he severed the head. The tide came up outside. Both went towards the deep sea. The living devil take them. In him I have avenged all my friends. I will never put another instead of him. The ætheling Eadwig, was Edmund Ironside's last surviving full brother (their mother was Æthelred's first wife). Though not mentioned by the ‘Anglo-Saxon Chronicle’, Edmund's two infant sons were also exiled, but, eventually finding refuge in Hungary, they managed to avoid their uncle Eadwig's fate. Æthelred's widow, Emma, was a Norman. Her father was Richard the Fearless (Richard I), and her brother was the incumbent duke of Normandy, Richard the Good (Richard II). It seems reasonable to suppose that Cnut's main motive for marrying Emma was to neutralize the threat of her brother pursuing a claim to the English throne on behalf of Edward and Alfred, Emma's sons by Æthelred. The two æthelings would remain exiles in Normandy for the duration of Cnut's reign. Emma and her boys had been obliged to take temporary refuge in Normandy, from Swein Forkbeard (Cnut's father), in 1013 (see: The Wrath of God). They returned to England the following year. Edward and Alfred would appear to have been despatched to safety in Normandy again after the death of Edmund Ironside (30th November 1016). A charter (S997a) from St Peter's Abbey in Ghent, though not certainly genuine, places Edward at St Peter's on Christmas Day 1016 – presumably en route for Normandy. William of Malmesbury writes (‘GR’ II §180): “I find that their Uncle Richard took no steps to restore them to their country; on the contrary, he married his sister Emma to the enemy and invader; and it may be difficult to say, whether to the greater ignominy of him who bestowed her, or of the woman who consented to share the nuptial couch of that man who had so cruelly molested her husband, and had driven her children into exile.” Rodulfus Glaber states (II, 3): “he [Cnut] made an agreement with Richard, taking in marriage his sister, Æthelred's wife”. Having spent 1017 securing his position, Cnut was apparently confident enough to discharge much of his army the following year. Thietmar of Merseburg mentions (VIII, 7): “In England the crews of thirty pirate ships were slain, thanks be to God, by their king, the son of King Swein; and he, who formerly with his father was an invader and assiduous destroyer of the province, now remained its sole defender”. Recorded by Symeon of Durham, the Scots' king, Malcolm II, in cahoots with Owain the Bald, king of Strathclyde, inflicted a defeat on Northumbrian forces: The Battle of Carham. If Rodulfus' story is right, these events should be set between 1017 and 1026, in which year Duke Richard died. The only recorded encounter between English and Scottish forces during that period was at Carham in 1018, but Cnut's reign is only sketchily recorded, and it doesn't seem unlikely that there were others. The generally held belief is that Cnut's brother, Harald, king of Denmark, had recently died, and that the motive for Cnut's 1019–20 expedition was to assure his own succession to the Danish throne. * He would be remembered by posterity as Cnut the Great. The cause of the rift between Cnut and Thorkell is not known. In Manuscript C the annal concludes: “And Archbishop Æthelnoth went to Rome.” Æthelnoth had been appointed archbishop of Canterbury in 1020. The purpose of his journey to Rome was to collect his pallium from Pope Benedict VIII (1012–24). The proceedings, which took place on 7th October 1022, are recorded in some detail by Manuscripts D and E. Manuscript E, though, adds: “And Abbot Leofwine, who had been unjustly driven from Ely, was his companion; and he cleared himself of everything that was said against him, as the pope instructed him, with the witness of the archbishop, and of all the company that was with him.” What crimes Abbot Leofwine had been accused of, or by whom, is not known – indeed, the anonymous, late-12th century, monk of Ely, who composed the ‘Liber Eliensis’ (Book of Ely), notes (II, 80): “we find no mention of him [Leofwine] in our written records, with the exception only that in an English chronicle one reads that, after being deposed by his men, he went on a journey to Rome, with Æthelnoth, archbishop of Canterbury ... [etc. as reported in Manuscript E]”. From a passing comment in the ‘Liber Eliensis’ (II, 109) it is clear that, at some time, Cnut had unsuccessfully laid siege to Ely: “in days gone by, even the ingenious valour of Cnut did not avail to storm this fortress.” Presumably this happened during the fighting of 1016 – at one stage, the ‘Anglo-Saxon Chronicle’ reports that Cnut's army: “went from London with their ships into the Orwell, and there went up, and went into Mercia, and slew and burned whatever they overran, as is their wont”. When nigh rowed Cnut the king. And let's hear these monks sing! It is said that in some years Cnut was not able to reach Ely for the festival: “because of the excessive frost and ice in the locality, the marshes and meres being frozen all around.” On one occasion, though, he: “took it into his head, at a time when a severe frost was continuing unabated, to travel all the way to Ely over the mere from Soham in a wagon upon the ice. But he declared that he would complete, and not defer, the difficult journey more confidently and less fearfully, if someone would go ahead of him. Well, it chanced that standing by in the crowd was a certain large and rugged man from the Isle [of Ely], Brihtmær surnamed Budde on account of his bulk, and he promised to go ahead of the king. Without delay the king followed behind in the wagon at a fast pace, while everybody marvelled that he should have attempted such a great act of daring. When he arrived at Ely he joyfully celebrated the festival there according to custom.” Needless to say, Brihtmær was handsomely rewarded for his service to the king. Harthacnut, who can't have been more than five years-old, was the only son of Cnut and Emma. He was still in England in June 1023, so perhaps it was a son by Cnut's earlier liaison with Ælfgifu of Northampton that was despatched to Denmark. Presumably, Cnut wouldn't have made the deal he did with Thorkell if the latter did not have strong military support. * Be that as it may, after this, Thorkell simply disappears from history. William of Malmesbury claims (‘GR’ II §181) that Thorkell (“who had been the instigator of the murder of the blessed Ælfheah”), having sailed to Denmark on his banishment, was: “killed by the chiefs the moment he touched the Danish shore”. William evidently got this misguided notion from Osbern of Canterbury, who, in his colourful account of the translation of Ælfheah's body to Canterbury, written, in Latin, in the 1080s, asserts that Cnut: “banished him [Thorkell: “the wickedly bold Prince of wickedness”] to Denmark with only six ships for protection. When he had landed there, the Chiefs of the Danes suspected he planned to raise internal wars. Thorkell was immediately driven out from all the places of that region. Eventually he was killed by the rabble, and his body miserably thrown out to the wild beasts and birds.” Osbern and William evidently didn't know that Thorkell had, according to Thietmar of Merseburg anyway (VII, 43), tried to save Ælfheah. Another figure who vanishes from the record in 1023 is Eric of Hlathir. * From c.1000, Earl Eric, a famed warrior, had ruled in Norway under Danish suzerainty. Whist Eric was engaged in Cnut's campaign to conquer England, Olaf Haraldsson, known as Olaf the Stout, established himself as king of Norway (Olaf II). Now, according to the timescale suggested in the story told by Snorri Sturluson, it was in the spring of 1025 that Cnut sent envoys to Olaf Haraldsson, offering not to invade Norway if Olaf agreed to rule with Cnut as his overlord. * Not surprisingly, Olaf sent a message back to Cnut rejecting his proposal – vowing: “I will defend Norway with point and edge, as long as my life lasts, and moreover pay no man taxes from my realm.” Expecting the worst, Olaf sought an alliance with his brother-in-law, King Anund of Sweden. In the autumn, Cnut, “with very large numbers of men”, sailed to Denmark. He was told that messages had been exchanged between Olaf and Anund: “and that plans for some great undertaking must underlie them.” Cnut sent his own messengers to Anund, in an attempt to prevent him getting involved. Anund did not, however, respond favourably to Cnut's overtures, and it was obvious to the messengers: “that King Anund must be very inclined to friendship with King Olaf.” So, in the summer of 1026, Cnut and his army returned to England. He left behind his son, Harthacnut, and installed his brother-in-law, Earl Ulf Thorgilsson, as his viceroy and guardian to Harthacnut. (There is no mention of the arrangements Cnut had made for the government of Denmark before this point). When Cnut had gone, Ulf persuaded the Thing to declare Harthacnut king of Denmark. Ulf claimed that that was what Cnut desired, and produced a forged letter to back up his claim. It is said that Emma was the brains behind the scheme, and that it was her who provided the falsified document. The next summer, i.e. 1027, saw the fleets of Olaf and Anund harrying Denmark, intent on conquest. Harthacnut and Ulf didn't believe that they had sufficient force to oppose the two kings, so they awaited the arrival of Cnut. Cnut, accompanied by Earl Eric's son, Earl Hakon, duly arrived with a large fleet. * Harthacnut begged his father's forgiveness (he couldn't have been more that nine years-old), which was readily given. Rather than face Cnut himself, Ulf despatched his own son (the same age as Harthacnut) to act as his emissary. Cnut sent the boy back, with the message that Ulf should: “muster an army and ships and thus come to meet the king, but he would talk later about his atonement. The earl did so.” Cnut heard that Olaf and Anund were ravaging the Danish province of Scania (Skåne, in Sweden), and sailed against them: “he had a great army and one twice as big as their two put together.” When he caught-up with the two kings' forces, Cnut decided it was too late in the day to engage them, so he moored-up his own ship, and as many ships of his vast fleet as he could, at the mouth of the Holy River, leaving most of his ships at sea. However, he had fallen into a trap. A dam, constructed for the purpose by Olaf and Anund, was broken – water and debris cascaded onto the ships moored in the river mouth, killing many men. Cnut's ship, “the great dragon ship”, was propelled into the midst of the enemy ships. It was recognized and attacked, but it was so large and well defended that the attackers made little headway. Earl Ulf arrived with his fleet, “then a battle began”, and the ships of Cnut's fleet that had remained at sea began to close in on Olaf and Anund. The two kings realised they had achieved as much as they could, and made a hasty exit before Cnut could fully recover. Olaf was keen to continue the campaign, but the Swedes were reluctant, and Olaf and Anund parted company. This story implies that Ulf fought on Cnut's side – in a speech Snorri later gives him, Ulf claims that it was his intervention at the Holy River that had saved Cnut – but Saxo Grammaticus is clear that Ulf was on the side of Olaf and Anund, indeed, Ulf is portrayed as the mastermind behind their alliance against Cnut. * In Saxo's story, many of Cnut's men perished when Ulf enticed them to cross, en masse, a bridge which they had constructed, and which collapsed under their weight. In the stories of both Snorri and Saxo, Cnut later, though in different circumstances, has Ulf killed. At any rate, it would appear that the battle at the Holy River dated 1025 by the ‘Anglo-Saxon Chronicle’ is the same as that placed in 1027 by Snorri's story,* and that the encounter was not the disaster for Cnut implied by the ‘Chronicle’. The ‘Anglo-Saxon Chronicle’, though it refers to Ulf and Swedes, does not place Olaf Haraldsson at the Holy River. It does, instead, link one Eilaf (Eglaf) with Ulf. It is possible that this is the result of a copyists slip, and that Olaf was meant. Aliatair Campbell* thinks it “most probably right” that Eglaf, in the ‘Anglo-Saxon Chronicle’, is a scribal mistake for Olaf: “Such a slip might very easily be made by a copyist owing to the fact that Úlfr [Ulf] was very closely associated with Eilífr [Eilaf] in England”. On the other hand, Frank Stenton** writes: “For reasons which are quite unknown they [Olaf and Anund] were joined by Ulf, the regent of Denmark, and by Eilaf, Ulf's brother, whom Cnut had made an earl in England.” If it was, indeed, Ulf's brother who opposed Cnut at the Holy River, he clearly made his peace with the king, and managed to avoid his brother's fate. * ‘Encomium Emmae Reginae’ (1949), Appendix III. ** ‘Anglo-Saxon England’, Third Edition (1971), Chapter 12. In the letter, Cnut is styled “king of all England, and Denmark, and Norway, and part of the Swedes”, which may reflect that Cnut considered himself to be the legitimate king of Norway, but, in reality, in 1027, he was not. In fact, the letter, as reproduced by Florence of Worcester and William of Malmesbury, is evidently a post-Norman Conquest translation, of an Old English original, into Latin, and it may well be that it has been tampered with to reflect the position in 1031, which, for reasons that will shortly become apparent, is, indeed, the year to which Florence and William wrongly consign it. Cnut doesn't say, directly, that he attended the coronation – “I have lately been to Rome, to pray for the forgiveness of my sins, for the safety of my dominions, and of the people under my government” (§1) – but details from the letter make it clear: “Be it known to you, that at the solemnity of Easter, a great assembly of nobles was present with pope John [ John XIX, 1024–32] and the emperor Conrad, that is to say, all the princes of the nations from Mount Garganus to the neighbouring sea [i.e. the North Sea]. All these received me with honour, and presented me with magnificent gifts.” (§5). Cnut had taken the opportunity to negotiate “with the emperor himself, and our lord the pope and the nobles who were there, concerning the wants of all my people, English as well as Danes [no mention of Norwegians]” (§6). He secured reductions in tolls for traders and pilgrims travelling to Rome, and concessions from the pope over the “immense sum of money” demanded from “my archbishops” (§7) whilst in Rome collecting their pallium. * “Moreover, all things which I requested for the advantage of my kingdom, from our lord the pope, and the emperor, and King Rudolf [Rudolf III, last independent king of Burgundy, r.993–1032], and the other princes, through whose territories our road to Rome is situated, they have freely granted and confirmed by oath, under the attestation of four archbishops, twenty bishops, and an innumerable multitude of dukes and nobles who were present.”(§8). Cnut appears to have maintained friendly relations with Conrad. A marriage between the emperor's son, Henry (the future Henry III, Holy Roman Emperor 1046–56), and Cnut's daughter (by Emma), Gunnhild, was negotiated. Conrad ceded Schleswig and territory north of the Eider river to Denmark as part of the settlement. Henry and Gunnhild were married in 1036 – after Cnut's death. Gunnhild died in 1038. Conrad died the following year. From Cnut's comments, it would appear that the business at the Holy River had happened not long before his trip to Rome, which suggests that it took place in 1026. Snorri Sturluson tells how Cnut gathered his forces in Denmark, and then sailed to Norway. Olaf offered no challenge, and Cnut was accepted as king without fighting a battle. Olaf left Norway, finding refuge in Kievan Rus. This is the famous battle of Stiklestad. Snorri says (Ch. 235) it took place on 29th July – it started between noon and one-thirty, and Olaf was dead before three. By the time Olaf was meeting his end at Stiklestad (about 45 miles north-east of Trondheim), Swein and his mother had arrived at Viken (Oslofjord). They travelled through Norway – Swein being accepted as king everywhere he went. Cnut was in Rome in March 1027, but his visit is not recorded by the ‘Anglo-Saxon Chronicle’ – there are, indeed, no entries s.a. 1027 in any ‘Chronicle’ manuscript. (Taking their cue from the ‘Chronicle’, Florence of Worcester and William of Malmesbury consign Cnut's letter, actually written in 1027, to 1031.) It is, of course, possible that Cnut made another visit in 1031. It is, though, also possible that Cnut made only one journey to Rome, in 1027, but it has been wrongly assigned to 1031 in the ‘Chronicle’. * If the latter is the case, then does what follows-on s.a. 1031 in Manuscripts D and E, which now part company, actually pertain to that year or to 1027? Sighvat's verse is preserved in ‘Heimskringla’, where Snorri Sturluson also works its substance into the ‘Saga of Olaf Haraldsson’ (Ch. 131). Sighvat, who served as Olaf's court poet, is given a part to play in the story. The setting is the spring of 1025, when Cnut has sent messengers to Olaf offering not to invade Norway if Olaf agrees to rule with Cnut as his overlord. When he hears what the messengers have to say, Olaf comments: “Cnut rules over Denmark and over England, and he has now even made subject to himself a large part of Scotland. Now he is laying claim to my patrimony from me.” After Olaf has roundly rejected Cnut's offer, Sighvat has a conversation with the messengers: “They told him whatever he asked, about their interview with King Olaf and also about the conclusion of their mission. They say that he received their business with great hostility. “And we do not know,” they say, “why he dares to refuse to become King Cnut’s man and go to see him. And that would be his best course, for King Cnut is so kindly that men of rank never offend him so greatly that he does not forgive it all when they go to see him and pay homage to him. It happened a little while ago that two kings came to him from the north, from Fife in Scotland, and he gave up his anger with them, and gave up to them all the lands that they had had earlier, and great friendly gifts as well.” ” It is at this point that Sighvat launches into the verse which begins as above, and which continues: “Olaf the Stout never thus yielded his head to anyone in this world. He often fought till victory.”* The reference to Olaf in the past tense suggests that the verse was actually composed after Olaf's death, i.e. after 1030. At London he [Cnut] was on the Thames. On the bank, on the sand. It approached fast, it came near the king. Cnut in his hand held his staff. And more and more the tide rose. The king stood, he waited. Then he struck the water with his staff. Before it came up to the king and wetted him. He went back from the beach. Men ought truly to believe and worship. He is a good king, I am a poor one. Him I pray to be my guard. I will go to Rome to seek Him. Then he had his way prepared. He would go without delay. But he did not tarry there long. The ‘Liber Vitae’ of the New Minster, Winchester, produced in 1031 (British Library MS Stowe 944), begins with a depiction of Cnut and Emma (Ælfgifu) placing a golden cross on the minster's altar (pictured right). Meanwhile, in Norway, the rule of Swein and, particularly, his mother, was deeply resented. * The late King Olaf Haraldsson, to whom many miracles were attributed, and who was being venerated as a saint, became the focus of an upsurge of nationalism. In 1034, a Norwegian deputation travelled to Novgorod (in Kievan Rus), where Magnus, the ten-year-old son of St Olaf, was living at the court of King Yaroslav the Wise. Magnus was invited to return to Norway, and press his claim to the throne. In 1035, with an army raised in Sweden, Magnus entered Norway. Swein was unable to gather sufficient force to resist him, and was obliged to flee to Denmark. Snorri Sturluson says that Harthacnut immediately offered to share the rule of Denmark with Swein, and that Swein accepted. (Presumably, Swein was accompanied to Denmark by his mother, but Snorri makes no reference to her). In the autumn of 1035, Magnus was established as king throughout Norway (Magnus I ‘the Good’). “... all who had heard of his death were moved, and especially his own subjects, of whom the majority would have wished to die with him, if this would not have been at variance with the divine plan. Florence uses the Latin dux (plural duces) in lieu of the vernacular Anglo-Saxon title ‘ealdorman’. Æthel (Æþel) means ‘noble’ (it features as an element of many Anglo-Saxon names), and an ætheling is a male of royal blood who is an eligible candidate for the throne. In Manuscripts C and D: “ten-and-a-half thousand”. Actually, this is expressed idiomatically endlyfte healf þusend, i.e. ‘the eleventh-half thousand’, which has been mistakenly rendered as “11 [xi] thousand” in Manuscript E (and in Manuscript F, Manuscript E's abridged bilingual relative). In the ‘Knytlinga Saga’ (§8), Harald is said to have died before Swein Forkbeard, so Cnut, aged ten, became king of Denmark on Swein's death (1014). This is evidently wrong on all counts. Wergild: the monetary value, based on rank, of a person's life. The Wends lived on the southern Baltic coast. The Scandinavian title ‘earl’ (Old Norse jarl, Old English eorl) supersedes the English title ‘ealdorman’ during Cnut's reign. Henry, though, writing in Latin, uses the term consul. The location of Assandun is not certain. Two candidates are proposed: Ashdon, near Saffron Walden, in north-west Essex; or Ashingdon, near Rochford, in south-east Essex. In Manuscripts C and E ‘the Isle of Wight’ is rendered simply Wiht. In Manuscript D it is Wihtlande. The Isle of Wight is represented in both forms throughout the ‘Chronicle’. However, for want of a reason for Cnut to be on the Isle of Wight, scholars often mention that Witland, in an addition that King Alfred the Great made to his translation into Old English of Orosius' ‘Historiarum Adversus Paganos Libri Septem’, refers to an area on the Baltic coast adjacent to the Wends. It may be recalled that Henry of Huntingdon has Cnut's forces fighting against the Wends (albeit in “the third year of his reign”). Also, if Wiht/Wihtlande is the Isle of Wight, the ‘Chronicle’ does not report that Cnut left England, which he definitely did. Nevertheless, although it is inconvenient, it is almost certain that the Isle of Wight is the correct meaning. Florence of Worcester adds that Thorkell's wife, Eadgyth, was expelled with him. Ælfgifu's father was Ælfhelm, the ealdorman of southern Northumbria who was murdered, purportedly at the instigation of Eadric Streona, in 1006. She is known as Ælfgifu of Northampton to distinguish her from Queen Emma, whose English name was also Ælfgifu. (Northampton because her father was a substantial landowner there.) Frank Stenton* refers to her as Cnut's “temporary wife”. * Sir Frank Stenton, ‘Anglo-Saxon England’, Third Edition (1971), Chapter 12. ** ‘Encomium Emmae Reginae’ (1949), Appendix III, p75 footnote 10. William of Malmesbury (‘GR’ II §181) maintains that, like Thorkell, Eric was banished by Cnut, and returned to his “native land”. Earl Eric (Yrik dux) last appears is in the witness-list of a charter (S960) dated 1023. Though not impossible, it seems unlikely that the banishment of such an eminent personage would avoid being noticed by the ‘Anglo-Saxon Chronicle’. Perhaps more likely is Snorri Sturluson's statement that Eric: “was going to set out on a pilgrimage to Rome, but then he died of a haemorrhage there in England.” Snorri, though, is obviously mistaken when he implies that Eric's death was in the autumn of 1017 (‘Heimskringla’, ‘Saga of Olaf Haraldsson’ Chapter 25). In the witness-lists of Latin charters the term dux is conventionally employed in lieu of both the Anglo-Saxon title ‘ealdorman’ and its Scandinavian equivalent ‘earl’. ‘Heimskringla’, ‘Saga of Olaf Haraldsson’. Absolute dates are not provided, but events in 1028 and 1030 provide reference points. ‘Heimskringla’, ‘Saga of Olaf Haraldsson’ Chapters 131–132, 134 and 145–154. Thing: Scandinavian governmental assembly of freemen. When Eric joined Cnut in England, Danish interests in Norway had been left in the hands of, Eric's brother, Swein and Eric's son, Hakon. Following his overthrow by Olaf Haraldsson, Hakon joined Cnut in England. Swein, after being defeated by Olaf, in a sea-battle off Nesjar (in the mouth of the Oslofjord), went to Sweden. He died soon after. Two terms commonly used by Latin-writers in lieu of both the English title ‘ealdorman’ and its Scandinavian equivalent ‘earl’, are dux and comes. The Latin dux is at the root of the later English title ‘duke’. The Latin comes is the source of the French title comte, Anglicized as ‘count’, a title that was not adopted in England (though ‘countess’ was – in the British peerage, an earl's wife is a countess). The situation in Wales at this time: Dynastic Disputes. The mountainous peninsula that projects, like a spur on the Italian boot, into the Adriatic Sea. The presence of “Rudolf, king of Burgundy, and Cnut, king of England”, at the coronation, is recorded by Conrad's biographer, Wipo, writing in the early-1040s. The ‘Anglo-Saxon Chronicle’ has no entries s.a. 1027. Comprising, roughly, northern Ukraine, Belarus and part of western Russia (including where Moscow is now), with its ‘capital’ at Kiev. Hakon's mother was Cnut's sister Gytha. The name of the sister who, according to Florence, was married to the mysterious King Wyrtgeorn is not known. Wyrtgeorn may be the Wrytsleof dux whose name follows that of Earl Hakon (Hakun dux) in the witness-list of a charter (S962) – recording the grant, by Cnut, of a parcel of land in Hampshire to the bishop of Crediton – dated 1026. Incidentally, Florence uses the Latin term comes in lieu of the vernacular title ‘earl’. Actually, it is widely suggested by scholars in the ‘single visit to Rome’ camp that Cnut set off in 1026, in Roman Numerals MXXVI, which has been misread as MXXXI, i.e. 1031. The author of the ‘Encomium Emmae Reginae’ mentions only one trip to Rome, but asserts (II, 20) that Cnut passed through Flanders, and claims that he saw the king (“with my own eyes”) at Saint-Omer. Cnut, himself, in his letter of 1027, says that he travelled to Rome from Denmark, and that he was going to return the same way. Whilst Saint-Omer is conveniently on-the-way for a journey made from England, it is not so for one made from Denmark. The Encomiast also says (II, 23) that Cnut died “some little time” after his return from Rome, which isn't particularly true for a journey made in either 1027 or 1031, but, obviously, is more so for the later date. Iehmarc could be one Echmarcach son of Ragnall. Echmarcach had a long and chequered career, but his first appearance in Irish annals is not until 1036, at which time he began his first spell as king of Dublin. Now, if this identification is correct, and if Ragnall, Eachmarcach's father, is the king of the Hebrides who died in 1005 (there are other possibilities), then perhaps the Iehmarc of the ‘Chronicle’ was ruling the Hebrides at the time of his submission to Cnut? The ‘Saga of Olaf Haraldsson’ extracts are translated by Alison Finlay and Anthony Faulkes (‘Heimskringla’ Vol. II). The prose rendition of Sighvat's verse is by Dorothy Whitelock (‘English Historical Documents’). Gorm the Old, Harald's father. 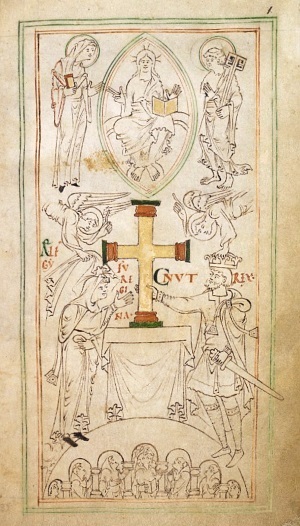 The story of Cnut and the waves features in Henry's History from its earliest incarnation, but the embellishment about Cnut giving his crown to the crucifix first appears in a revision of c.1140. The whole statement reads: “When, however, King Cnut first obtained the absolute rule of the Danes, he was Emperor of five kingdoms, for he had established claim to the rule of Denmark, England, Wales [Britannia], Scotland and Norway.” This, though, is plainly premature, since when Cnut succeeded his brother in Denmark, Norway was under Olaf Haraldsson's control, and Cnut's, apparently short-lived, overlordship of Scotland was still in the future. Known as ‘Lausavísur 2’ – preserved in the, so-called, ‘Legendary Saga of St Olaf’, which survives in a single mid-13th century Norwegian manuscript. Pages 252–5 in the 1893 Evans & Rhys edition of the ‘Liber Landavensis’. Translation by W.J. Rees. The year 1022 is said to be the first year of a nineteen-year, i.e. Metonic, cycle. However, 1022 is actually the sixteenth year of the cycle. The only first year of the cycle during Æthelnoth's tenure at Canterbury is 1026. * ‘Ireland, Wales, and England in the Eleventh Century’ (1991), Chapter 4. ‘Heimskringla’, ‘Saga of Magnus the Good’ Chapter 4. In fact, Manuscript E (and its relative, Manuscript F) places Cnut's death, which occurred in 1035 (on 12th November, not recorded by E and F), s.a. 1036 – there being no entry s.a. 1035. The pallium: a white, scarf-like, vestment worn by the pope, and bestowed by him on archbishops as a symbol of delegated papal authority. Æthelnoth, archbishop of Canterbury, had received his pallium on 7th October 1022. Ælfric, archbishop of York, had received his on 12th November 1026. The consecration of the church at Assandun probably took place on the anniversary of the battle, which would explain the absence of the archbishop of Canterbury at the ceremony – Archbishop Lyfing died on 12th June, and his successor, Æthelnoth, was not consecrated until 13th November. Manuscript A has one of its occasional, late, entries (made at Christ Church, Canterbury), s.a. 1031. The annal has, however, for some reason at some time, been mutilated. Its partially erased opening statement can be reconstructed: “In this year Cnut came back to England”. It begins, legibly, to quote from a charter (it doesn't finish, the latter half having been erased), in which Cnut grants the harbour at Sandwich, and its income, to Christ Church. Cnut is said to have done this as soon as he arrived back in England. The charter, though, exists in other copies (S959), in which it is dated 1023. To add to the confusion, in Manuscript F, the scribe of which was likely also responsible for Manuscript A's Annal 1031 (MXXXI), the same charter based material has been consigned, as an afterthought, in both Old English and Latin, to the Old English and Latin entries for 1029 (MXXIX), which paraphrase the entry in Manuscripts D and E for that year: “In this year King Cnut came home again to England.” In short, the entry s.a. 1031 in Manuscript A looks rather like the error of a zealous Christ Church scribe, who intended to place it s.a. 1029. Thietmar, bishop of Merseburg from 1009 until his death on 1st December 1018. His Chronicle covers the period 908–1018. William, a monk of Jumièges Abbey, completed the ‘Gesta Normannorum Ducum’ (Deeds of the Dukes of the Normans) c.1070–1. He dedicated it to William the Conqueror, the 7th duke – Richard II being the 4th. ‘Cnut: England's Viking King 1016–35’ was first published as ‘Cnut: the Danes in England in the Early Eleventh Century’, in 1993. Late-12th/early-13th century Danish author of ‘Gesta Danorium’ (Deeds of the Danes), a chronicle of legendary and historical Danish kings.